American Airlines has launched its newly-renovated Flagship Lounge and brand new Flagship First Dining at New York John F. Kennedy International Airport. American began renovations to its Flagship lounges and announced its plan for Flagship First Dining last year as part of a $200 million investment in the luxury travel experience. American is expanding access for Flagship Lounges to include Business Class customers traveling on qualifying international and transcontinental flights, in addition to First Class customers on those flights who previously had access. The renovated and larger Flagship Lounge at JFK allows those customers to unwind, work or refresh before their flight with quiet rooms, individual work pods and showers. Customers will enjoy a range of food options including a robust hot and cold food buffet, an a la carte dining menu and a chef’s table with a rotating menu of made-to-order entrees. They can pair their meals with premium wine and champagne or a drink from our “make your own cocktail” station. Customers traveling in First Class on qualifying international and transcontinental flights will have exclusive access to Flagship First Dining, located within the Flagship Lounge. The sit-down restaurant experience will offer customers complimentary, full-service dining with locally-inspired menus. 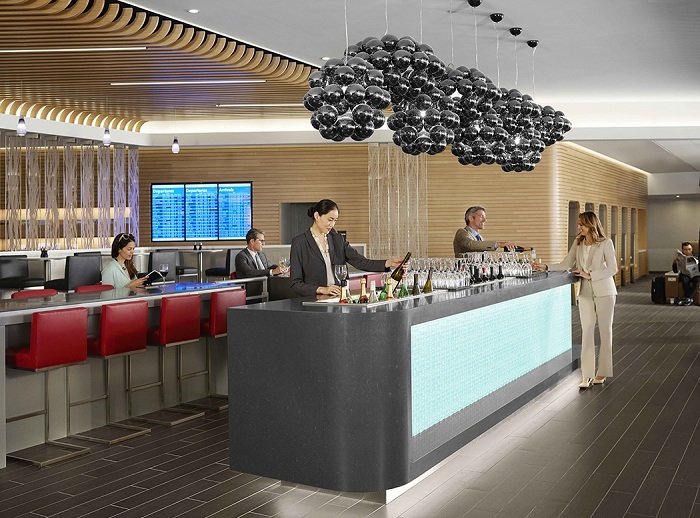 “Customers in the Flagship Lounge and in Flagship First Dining will enjoy elevated service throughout their trip,” said Kurt Stache, senior vice president, marketing, loyalty and sales, American Airlines. “We already provide the best premium in-flight experience among US airlines. “Now we’re thrilled to unveil our remodelled Flagship Lounges and to be the first US airline to offer top-of-the-line dining in the airport. American plans to add Flagship First dining this year at Miami and Los Angeles, and later at Dallas Fort Worth and London Heathrow.